Makeup Brushes have probably been one of the most anticipated items to be released from Makeup Revolution. I know I've waited in anticipation for these to be released, and I had a feeling it wouldn't be to far off after seeing some inside the exclusive gift sets at Superdrug at Christmas. Makeup Revolution haven't really put a foot out of place since they released almost a year ago. Bringing incredible dupes, high performance makeup that even gives higher end brands a run for their money. I didn't expect to much from the makeup brush range, after all what brushes are going to do the most amazing job when they range from just £1.50 with the highest costing just £3.75. But boy, was I wrong! Yes, Makeup Revolution have done it again and are on to a real winner with these. 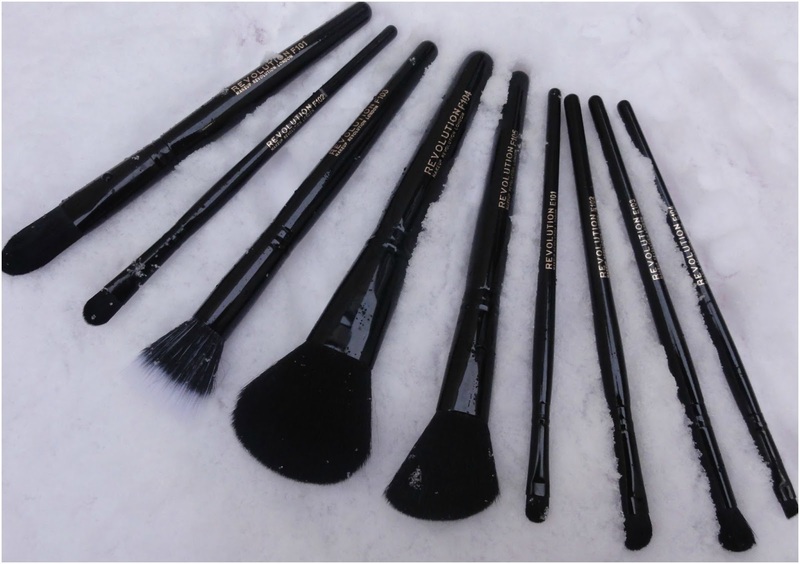 Each brush is engraved with the rose gold font we are use to seeing from the brand. They have synthetic hair, are animal friend and extremely soft, like so soft. Pro E101 Eyeshadow Brush £1.95 - The eyeshadow brush can be used with both powder and cream eyeshadows. This can be used for a more subtle eye look or a more dramatic look. True to it's description, the brush picks up just the right amount of product to create a subtle look due to it's softness. The eyeshadow brush is an essential to my daily makeup routine and at £1.95 it's an absolute steal. Pro E102 Eyeshadow Contour Brush £1.95 - For me the contour brush is another must have. I love to do a neutral smokey eye and this is perfect for blending. I love that it's slightly angled to get right into the corners, something most eyeshadow blending brushes don't have. £1.95 guys... £1.95! Pro E103 Eyeshadow Blending Brush £1.95 - This brush is very similar to the contour brush but shaped differently. It's another favourite and blends the eyeshadow to perfection. I recommend picking up this and the contour brush due to the fact it goes right into the corner. Pro E104 Eyebrow Brush £1.50 - This is a definite favourite amongst the eye brush collection. I've not used it with many of the suggested products; liquid or cream eyebrow products. I have a bit of an habit of finding shades that match my brows amongst my eyeshadow palettes. The eyebrow brush defines my eyebrows perfectly. You can purchase all 4 eyeshadow brushes for just £6.00 here. Pro F101 Foundation Brush £3.00 - I'm not one to use a foundation brush if I'm honest and tend to opt for the traditional route of applying with fingers, however, I used the brush for it's true purpose and I was pleasantly surprised at how flawless my makeup looked. Serious thumbs up from me. Pro F102 Concealer Brush £1.95 - I've never been much of a fan of blending concealer in using a brush, I'm not sure why but I just never thought a brush did much of a good job. I don't wear concealer at all, though I should. This brush is beautifully soft like all the others and looks like it may work a treat when applying concealer. I'm yet to try it... sorry. Pro F103 Stippling Brush £3.00 - The stippling brush is a great little brush. I personally like to use it for blush, due to it's softness it picks up minimal product which is great for me cause I'm not keen on having my blush so intense. This is suppose to be used for blending foundation but I like my blending brush to be just a little firmer. Pro F104 Powder Brush £3.75 - I love this brush, it's just so soft. I use this to finish off my makeup with matte powder and it just finishes it beautifully. Pro F105 Contour Brush £3.00 - I contour my cheek bones practically everyday using a rounded +brush which doesn't define my cheek bones as much as I'd like it too. The F105 handles the job perfectly with it's slanted side that allows you to get right into the cheek bones - and for my chubby cheeks it's needed. The makeup brushes come to just £22.00 but you can buy them all for just £20.00 right now. PR Sample sent for review purposes from the Makeup Revolution Team. Thank you ever so much! these brushes look so good for the price, seen so many good reviews that i'm finding it increasingly difficult not to buy them - great post! wow these sound incredible, so cheap too!!! have you tried washing them yet? I'd hate to see them fail after the first wash! These brushes look great! Bargain and full of variety. I wonder how they compare to the likes of real techniques and mac brushes and the likes.